It is often said “We are defined not by our mistakes, but how we correct them”. Well, in the case of the species Homo sapiens, it doesn’t hold true. In fact, the opposite is true. We are defined by our mistakes. Over the course of history, humans have made extremely great advances. But at the same time, we have made horrible decisions. From the creation of the atomic bomb to the destruction of our forests, humans have taken certain decisions that have foretold disaster. But the worst of all would be the use of fossil fuels laced with heavy metals. Worse off, we have been releasing CO and CO2 into the atmosphere recklessly. This has had various levels of impacts on our health and the condition of the atmosphere – from the rise of hypoxia and carbon monoxide poisoning cases, to rise in sea levels and climate change. In recent years, the prices of petrol and diesel have been rising at an alarming rate and crude oil has become a luxury which will not be affordable to many people in the near future. This has not been the only problem of humans. We have invented a new type of food. The name is fried food. Everybody enjoys a good meal of kachoris and samosas. But one glance at the cooking oil in use will horrify you and make you think twice before licking your fingers after eating those fries. Most of the times, the oil is reused and becomes a dark brown viscous substance which is not only unappetizing but is extremely hazardous to our health. Used cooking oil has been noted to be the cause of heart attacks, strokes, and blocked arteries and in certain cases has been linked to Alzheimer’s, Parkinson’s and even cancer. Not only the health hazards but also disposing of the used cooking oil is a major problem. Disposing of the used oil in the soil can degrade the quality of the soil or throwing the oil in a drainage can clog the drainage. Indore citizens are well versed to fried food and hiked fuel prices both. That is why we took on this problem. Researching and working on both the major crises, we came up with a combined solution. After observing the problem at hand, we decided to tackle both the problems as a whole. We have combined the crisis of climate change and the increase in carbon dioxide levels in the atmosphere with the problem of discarding the harmful used cooking oil. As mentioned earlier the prices of petrol and diesel are ever increasing. Not just that, the combustion of these fuels releases high amounts of carbon dioxide and sulfur lead and iron impurities in the atmosphere which has now led to global warming which has its further consequences. 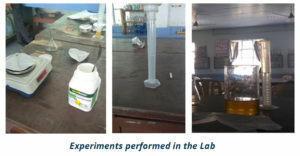 Also, when we surveyed the places where cooking oil is used on a large scale, we found out that people are aware of the harmful effects of reusing cooking oil but they are still reusing it. Therefore, it is very important to consider this problem and take a step towards it so that the health of people is improved and lives are saved. Taking a note of all these facts, we thought of making an alternative fuel from the used cooking oil which can replace the high dependence on crude oil. The alternative fuel is “biodiesel”. Further, the idea is that the carbon dioxide that will be produced when this biodiesel will be burned will be trapped and converted to methane via the catalytic process. This methane is one of the essential components of Compressed Natural Gas (CNG) and is one of the cleanest fuels in existence. The aim is to replace the use of petrol and diesel to biodiesel and CNG. 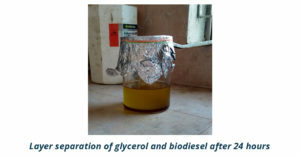 The production of biodiesel is carried out by a transesterification reaction. In this reaction, an ester (RCOOR’) and an alcohol (R’’OH) react in the presence of acidic or basic medium to produce another alcohol (R’OH) and ester (RCOOR’’). The basic premise of the reaction is that the alcohol replaces the alkyl group after the COO linkage and the alkyl group is released as an alcohol. In triglycerides (aka oil), the leaving alcohol is glycerol aka propane-triol. The 3 fatty acid chains get converted to alkyl methyl esters which are the major components of biodiesel. The methyl group is introduced by methanol reactant. The reaction proceeds by SN1 mechanism, and hence involves the formation of carbocation in the carbonyl group. Hence, alkali is used as a catalyst, which makes the methanol molecule more nucleophilic. Alternatively, we can also use acid as a catalyst, which makes the carbonyl carbon more electrophilic by protonating the oxygen of the carbonyl group. In this specific case, the base was used as a catalyst.